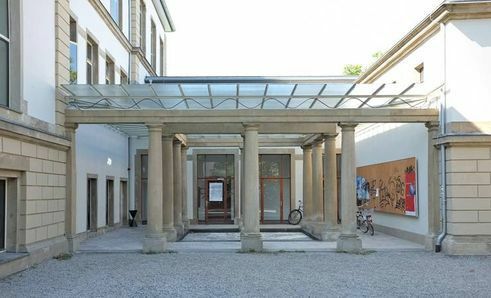 The Städelschule, founded 200 years ago, is a small academy that offers its students maximum freedom.The focus is on free art, on independence from all non-artistic constraints or purposes, on a concept of autonomy that resists all exploitative intentions. Neither the applied arts nor art pedagogy have a part to play here. Each year about 500 young people from around the world apply for admission, 20 are accepted, and with 140 students in the visual arts classes and 50 architecture students, the atmosphere retains a family quality. The students know each other, exchange ideas and experiences, meet at the long benches in the student cafeteria where for years now, meals are offered that have been prepared by cooks who are also artists. After all, this Frankfurt university was the first in which art and cookery were brought together. This is one of the peculiarities of an institution where only one in four students is German and English is the language of instruction. As manageably as the Städelschule is structured, the school’s orientation is international. Top-flight artists teach here, including Peter Fischli, Willem de Rooij, Douglas Gordon, Michael Krebber, and Tobias Rehberger. The impulses set here can be felt everywhere in the globally networked art world. Professors and graduates are present at the documenta in Kassel, the Venice Biennial, and other major events of the art-exhibition sector. Former Städelschule students are contributing to shaping contemporary concepts of art. What “artistic quality”, this elusive and controversial concept, means is also decided in Frankfurt. The closeness between teaching staff and students is one asset of the Städelschule whose value cannot be underestimated: the school permits everyone who has succeeded in gaining admission to freely choose the artistic direction in which they wish to go. There are no requirements other than developing one’s own artistic position. In a time in which university study is heavily regimented in Germany – where academic freedom has traditionally been a top priority – the Städelschule is an exception to the rule. Here, the idea, independent thinking, the concept come first. Only then do the skills follow of implementing ideas, finding an aesthetic form. The professors see their task primarily in encouraging their students’ independence. This also applies to an artist like Judith Hopf, who conceives of herself as a critic of social norms and who, with her linkage of object- and video art, stands for the practice of “mixed media,” such as currently prevails in the scene. The connection between different media, the linkage of performance, film, and the plastic arts is characteristic of the Städelschule. In this respect the school moves within the pathways of an avant-garde dedicated to dissolution of rigid forms, ascriptions and artistic genres. In her work, Anne Imhof, master-class student of Judith Hopf and 2012 Städelschule graduate, unites elements of performance, video art, installation with music of her own composition and – this is where the artist is truly innovative – choreographed movement sequences. This is no accident: dance as an element of performative art forms plays a pivotal role in the highly experimental Frankfurt cultural scene, which has an important forum in the Künstlerhaus (i.e. artists’ centre) Mousonturm. Also inspired by contemporary ballet with its high degree of abstraction is the three-part cycle of works entitled Angst (i.e. fear) – whose first and second part were to be seen in Basel and Berlin and whose third part is now being shown in Montréal. 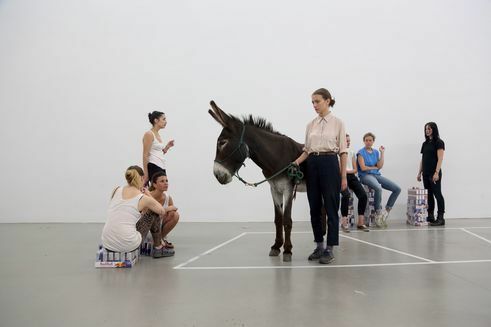 To Anne Imhof, born in 1978, staging the immediacy of the body and constellating actors with objects and effects such as artificial fog to continually changing images is a method of opposing an art market intent on traditional media such as painting or sculpture. The constellations that arise during a performance and those to be seen in videos, are constantly changing and thereby represent a counter-model to fixed forms. Anne Imhof had her first solo exhibition in 2013 in the Portikus, the Städelschule’s exhibition hall on an island in the Main River. It is reached via the Alte Brücke (i.e. old bridge) that crosses the river. No matter what is to be experienced there, it will awaken the interest of the international art scene. The Portikus is one of the most important facilities of its kind: here, artistic positions can be experienced with intensity and concentration. Imhof’s concept of using various media on an equal-footing basis is also shown in this presentation. For example, a photo documentation purported to render a parade to the exhibition’s opening that got nowhere, but in reality the images had been produced previously, without an audience. That the image is always Imhof’s central concern was shown at that time by choreographical sketches, precise spatial explorations, arabesques and figurative studies in coloured pencils, water colours or graphite. They varied the themes that are the artist’s central focus in all her performances: space and the body, time and movement. Michael Hierholzer is editor-in-chief of the cultural desk of the Rhein-Main-Zeitung at Frankfurter Allgemeine Zeitung. Copyright: Text: Goethe-Institut, Michael Hierholzer . This work is licensed under a Creative Commons Attribution – Share Alike 3.0 Germany license.